Ideally as the apartment is Maladroxia fine sand beach, which is located on the island of St. Antioco to the south-west of Sardinia. The apartment is located in a tourist resort with two restaurants and two pizzerias to 7 km from the village that in 5 minutes you raggiuge also find shops, banks, pharmacies, etc. Sites of historical and archaeological and natural 5-10-20 minutes away. The accommodation is spread on the 1st floor, with a veranda entrance open side, where they are positioned table, chairs and deck chairs. Interior: 1) kitchen w / table, chairs, refrigerator, TV; 2) master bedroom; 3) bedroom with two bunk beds; 4) bathroom with shower. Outside BBQ, tap with TV. Upon arrival a melaleuca tree will welcome under its branches. The apartment, in the months of low season (fall, winter and privavera), being in a geographical location of the island of S. Antioco strategically and practically adjacent to the beach Maladroxia is a good central base for daily outputs with itineraries divervi walk, all in close contact with a lovely nature, which in the cooler months expresses special colors and scents, in total silence and relaxation. 'Calendar, availability and prices are always updated. For more information, please contact by e-mail or phone. 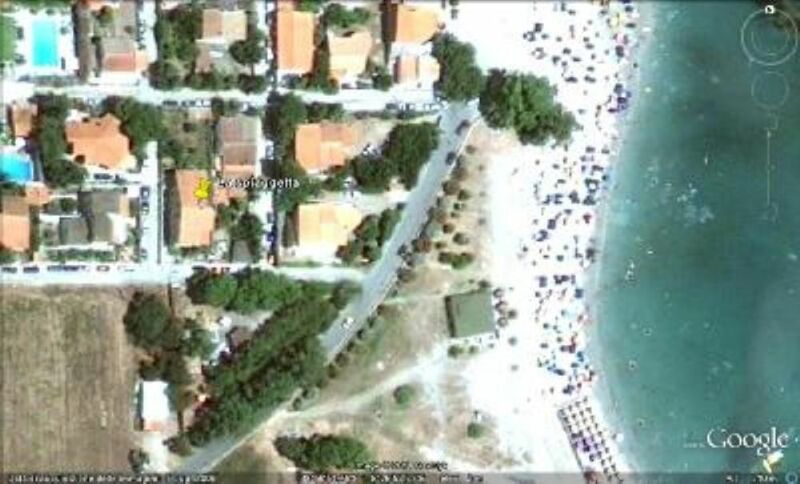 Very comfortable and clean apartment next to a pretty and fine sandy beach. Very quiet, excellent for families. The veranda is wide and well ventilate: it is the space we enjoyed the most. Location is perfect on the island. From Maladroxia we could visit every wonderful beach of S.Antioco driving only 15 minutes. Parking is not a problem anywhere. The owners are perfect: friendly, attentive and very helpful, with any information you may need for visiting the area. The island is one of the most beautiful part of Sardinia and it is absolutely worthy to rent or buy a kayak to explore the rugged coast. We had our inflatable, but the owners sell good ones, or you may want to rent one. That will make you visit unique because the most spectacular part of the coast is not easily accessible walking ( despite some great parts are doable within 30 minutes hike ). I have been visiting the north coast of Sardinia for 20 years, but the island of Sant'Antioco is much less crowed and much more relaxing and enjoyable also for sport people, but not less beautiful. "Excellent stay - the owners were delightful. The apartment is spacious, clean and very well situated. We hope to return. "the appartment is very cute and comfortable!! we spent a fantastic holiday(unfortunately too short).The owners were very kind and helpful to any requirement.we hope to be able to return to this land so distant and different from ours. it''s paradise!!" Puro relax nell'isola di Sant'Antioco. Gabriella é stata gentile, puntuale e disponibile. L'appartamento corrisponde alla descrizione, molto accogliente e dotato di tutto il necessario. Si trova nel piccolo golfo di Maladroxia in una splendida posizione a pochissimi metri dal mare. Aiutati dal clima primaverile fantastico e dalle belle giornate abbiamo trascorso una breve vacanza molto molto piacevole. Consigliatissimo per famiglie con bambini. Casa sul mare, adatta ad ospitare più di due persone, perfettamente corrispondente alle foto pubblicate. Qualche problemino, piccolino, per reperire parcheggio durante lo ore di maggior affollamento della spiaggia. Sant'Antioco, isola da visitare per il mare molto bello/molto bello..
"Die Wohnung ist schön eingerichtet und gut ausgerüstet inklusive intakten Moskitonetzen vor jedem Fenster. Die gedeckte grosse Veranda vor der Wohnung ist riesig. Die Fenster in den Rundbögen können geöffnet werden, so dass bei heissen Tagen immer etwas kühlender Wind durchzieht. Ich habe die Veranda extrem geschätzt. Der naheliegende Sandstrand ist gepflegt und wird öfters gereinigt. Das Wasser ist glasklar und das Schwimmen ein erfrischendes Vergnügen. Maladroxia ist ein kleines Örtchen ohne grosse Infrastruktur (1 Hotel, 1 Restaurant, keine Läden, 2 Strandbars). Bis Mitte September war es recht belebt, v.a. auch von einheimischen Touristen. Danach wurde es richtig ruhig, schon fast etwas verlassen, was mir aber auch gut gefallen hat. Andrea und Gabrielle D., die VermieterInnen, sind sehr freundlich und hilfsbereit und verraten so manchen Geheimtipp. Wo z.B. das Baden besonders schön ist, welche Spaziergänge besonders interessant sind und wo gut gegessen werden kann. Sie sind einfach sehr sympathisch. ho visuto un bel periodo di vacanze a Maladroxia. l''appartemento è bel'' ordinato e ottimo con tutto utile e necessario. sopratutto la veranda coperta è un luogo dove si può stare anche di notte tranquillamente. la spaggia e ben pulito e l''acqua è chiarissimo. Andrea e Gabriella D., i locatori, sono molto simpatici e servizievoli. io sono sicuro di ritornare, forse già l''anno prossimo perché sono stato molto bene qui!"